When is the Christmas season over? Well, if you ask me, it's when the last Christmas clearance item has left the stores at 90% off. I use Target stores in the USA as a yardstick for this. 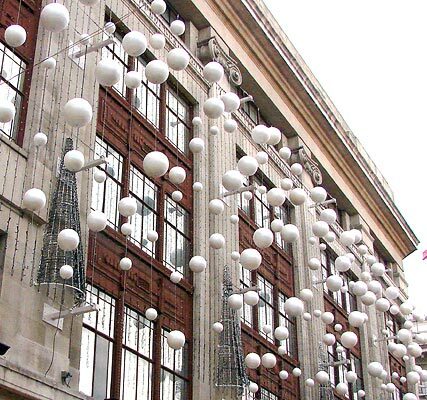 Keeping with this principle, I'm posting more Christmas stuff, like the photo above from Selfridges in London. 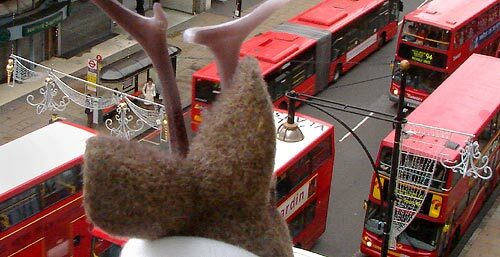 Ace Jackalope surveyed Christmas decorations over London's Oxford Street late this past October. 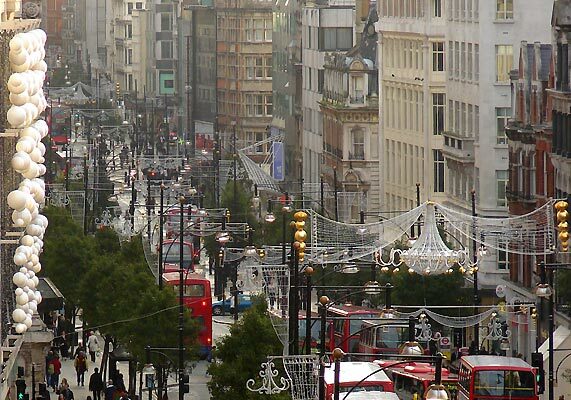 I've got a few photos of Christmas decorations in London, so I'm grouping them with photos of London shopping in general. 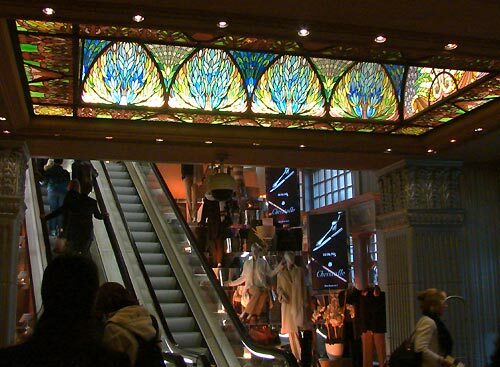 For our first shopping foray this past late October in London, we went to Selfridges department store. 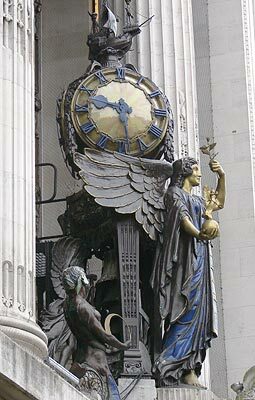 Selfridges, like other older London department stores, utilizes some nice statuary, like this one over the entrance. We don't have many grand old department stores left in the US, so this post is an homage to the type of place baby boomers like me grew up with. 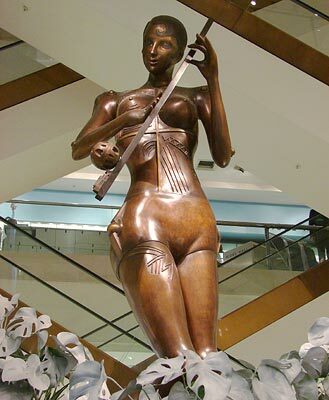 This statue on the ground floor of Selfridges reminded me of the robot Maria from the 1925 silent German expressionist science fiction film, Metropolis. This one is near the food department. 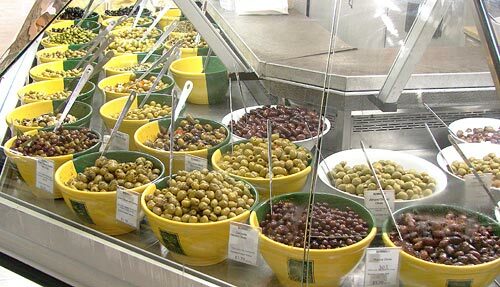 Which reminds me...need more olives for your Christmas leftovers? This is part of the olive assortment in Selfridges food court. I love olives. I'd like to try all of these olives until I get sick, but I digress. 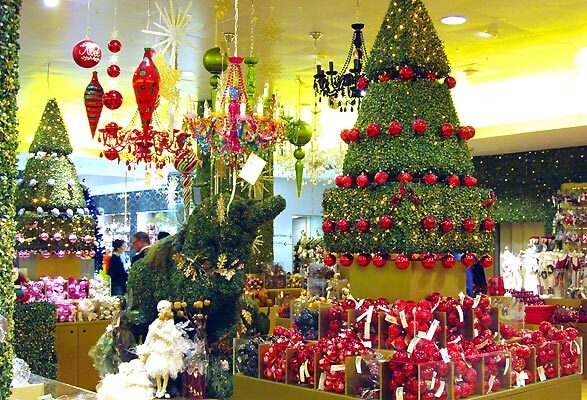 Of course, even though it was not even Halloween yet, I headed for the Christmas section. I wasn't disappointed. Decorations were, overall, surprisingly perky. They were a welcome sight considering we'd just come in out of the grey of a rainy London day. There were also more traditional color palates, such as the subdued tones of these topiaries. 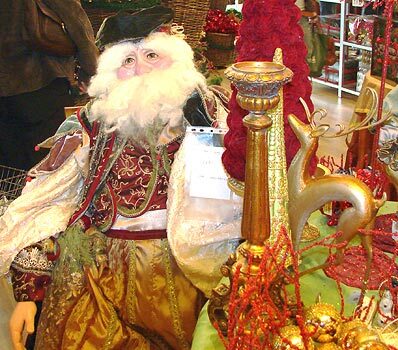 I was surprised that most of the Santas were more-or-less like the ones in the USA. I spotted no traditional robed Father Christmas images. In fact, Santa was far from a dominant motif here. 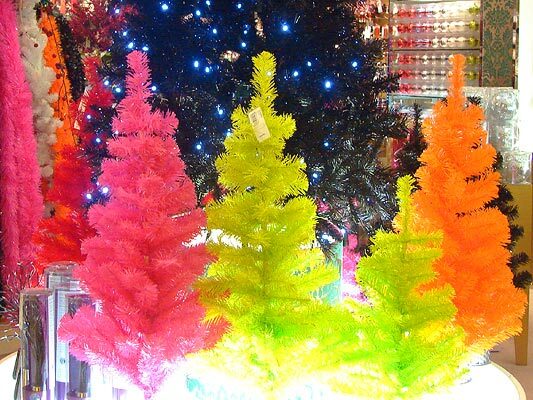 The brightly garish stuff was delightful, though. 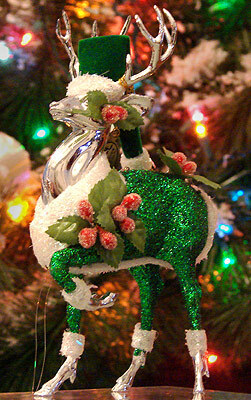 There was a small assortment of retro-Christmas decor. 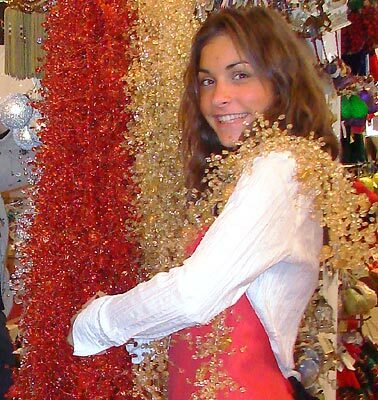 The prices weren't retro, however; that pack of nine pipe cleaner Santas was 31.95 pounds. That's about $60. 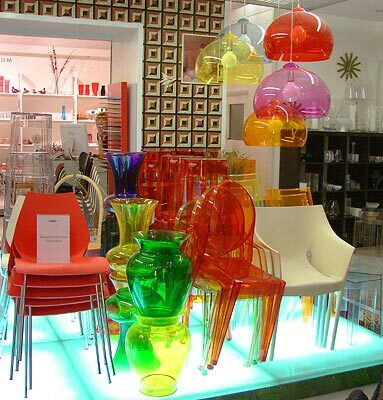 Speaking of retro, check out this chair in the home furnishing department. 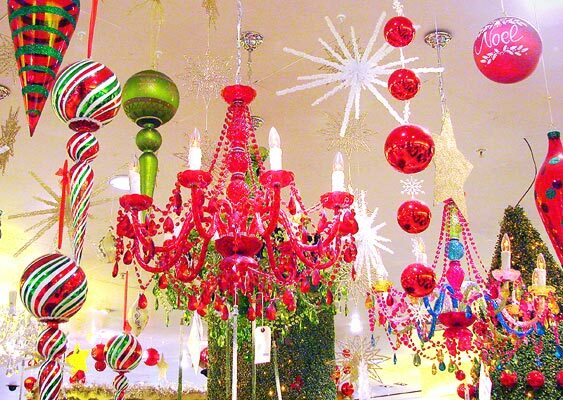 Perhaps the ultra-bright colors of some of the Christmas decorations were part of a generally popular look of late. Here's more furniture. Why don't they sell the really good stuff? Here's a poster in one of the clothing department at Selfridges. I wonder if the text means: "stupid American with camera takes surreptitious pictures in store?" 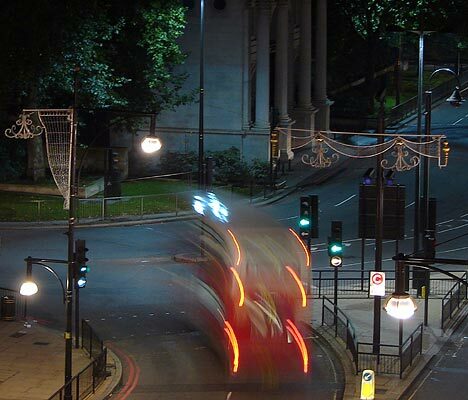 Walking on down Oxford street to Marks and Spencer, I shot these inactive lights. I asked, and they, along with all of the other Oxford Street lights, were not to be lit until November. 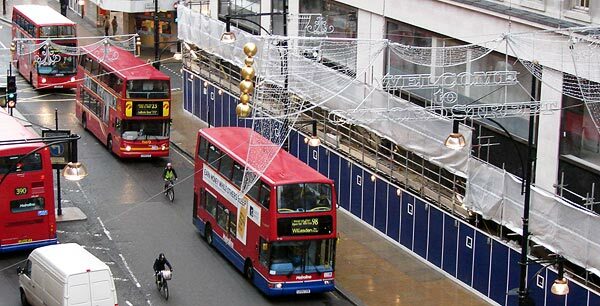 Here's a view showing the front of Marks and Spencer (left) facing Oxford Street with its decorations strung over the London traffic. Check out the huge chandelier. ...and every night after returning from exploring the city. 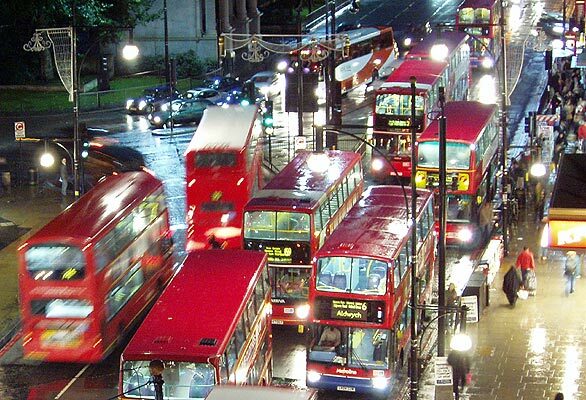 We had a great view of traffic passing near Marble Arch while most of the busses were still running, before midnight. And at 2AM, when only the night busses ran. We just wish the decorations would have been turned on, but they wouldn't be November 9, about two weeks after we left. I did find a page with a few nice photos of the lights in all their glory, here. Fortunately, the disappointment at the lack of active Christmas lights on Marks and Spencer was slightly offset by the lingerie poster on the side of the building. You see a lot of this sort of thing in London and it's surprising until you remember that we are largely descended from the puritans who left this country. 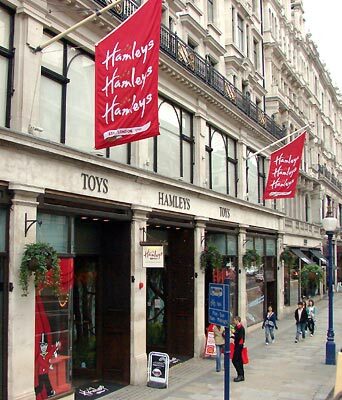 The next day, we stopped at the biggest toy store in London, Hamley's on Regent Street. 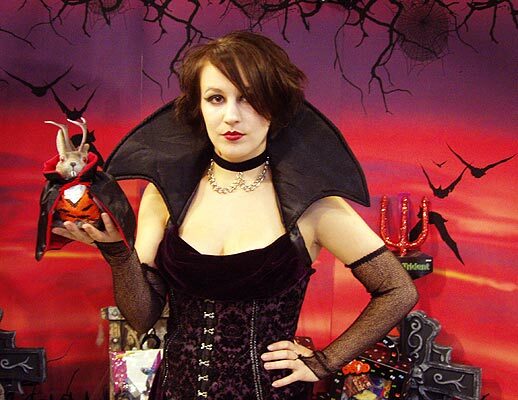 I've previously mentioned Hamley's, when I photographed the rarely-seen vampire jackalope there. Esmerelda here was part of a Halloween promotion, somewhat of a rarity in London, which has not quite fallen hook, line and plastic pumpkin for the holiday. By the way, do you think that if Toys R Us had employed women like this to walk around their stores, chatting with fathers and sons, that they'd have had to file for bankruptcy? I think not. 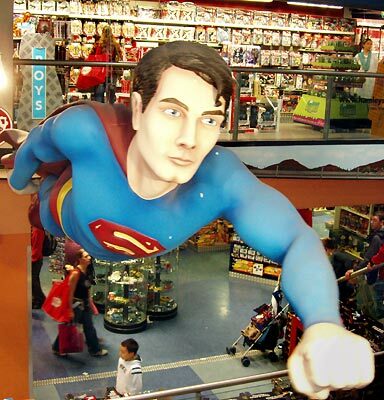 This approx 20 ft Superman rotated in the atrium, visible from all of the floors. Hamley's is huge, by the way...four or five stories as I recall. 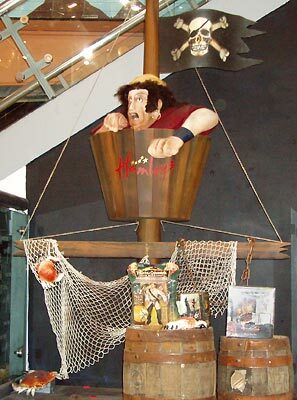 Pirates were big at Hamley's. That's as it should be because, as we've noted before, pirates are cool. As an former model railroader, I enjoy seeing model trains in different countries. 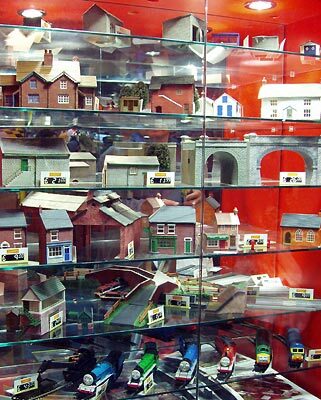 Trains by a company called Hornby are big sellers over here. 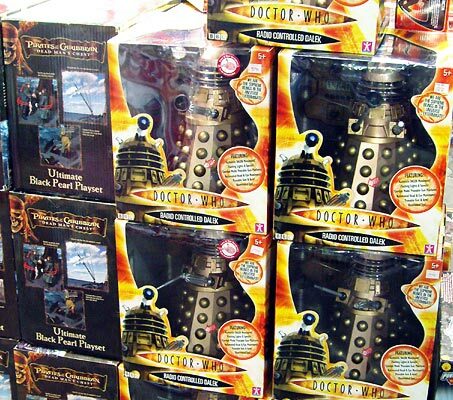 Doctor Who toys are a bit of trouble to get in the USA, but readily available in England, where the age-old, cult status TV series is produced. 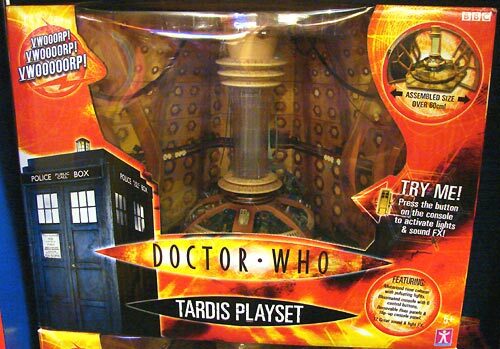 They had a couple versions of the Doctor's time and space ship, the TARDIS. "TARDIS" is an acronym for "Time And Relative Dimension In Space;" given his already proficient ability with disguise, I hesitate to think what Ace might do with a working time and space ship. The exterior of the TARDIS is disguised as a British police box, a real-life relic of police technology past. A police box was a small booth which housed a telephone with which people could call the police or the police could call a station; they also served as shelter or temporary confinement for prisoners. Improvements in telecommunication made them obsolete, but one with a retro-look and new technology was installed in 1996 near the Earl's Court tube station in London. It fell off the edge of my list of things to see, but I'll get it someday. I bought this toy, by the way. See the damaged package? After an unsuccessful attempt to get into an over-crowded tube carriage, I was backing out and the doors snapped closed on my shopping bag. I didn't properly mind the gap. These are daleks, a perennial enemy of the Doctor through the run of the series. 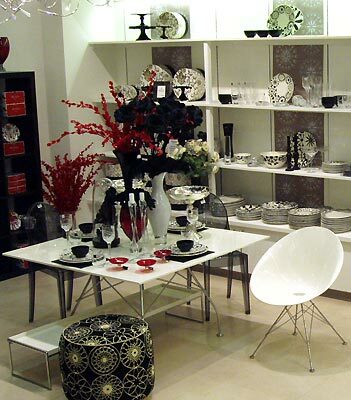 Another day and another department store. We spaced these out in between museums and other attractions. 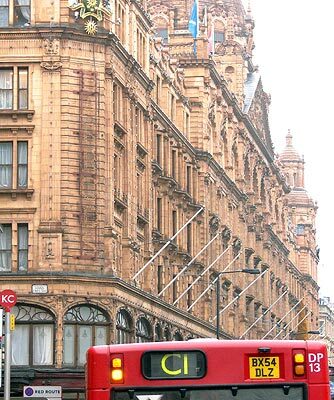 This is Harrods department store, famous for generations in London as a place for the upper crust to shop. Let's see if it's really very interesting. Well, yeah, it is. 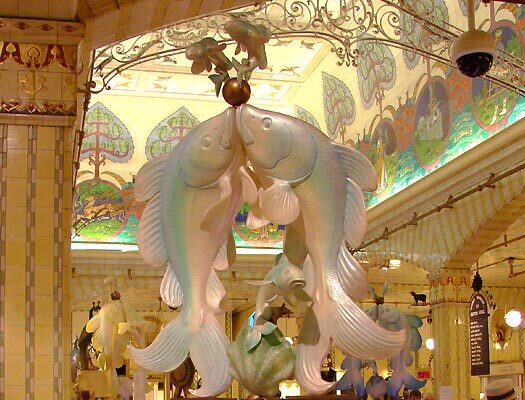 It turns out that Harrods has history as well as interesting architecture and interior decor. The business has been on this same site in the Knightsbridge area of London since 1849; the current building dates from about 1901. According to their website, Harrods introduced the world's first escalator in 1898 and served brandy at the top to "revive nervous customers." 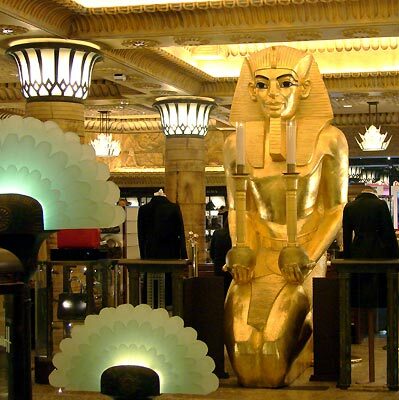 In the 1980s the Fayed family (of the late Dodi El Fayed, beau of the equally late Princess Diana) acquired Harrods. 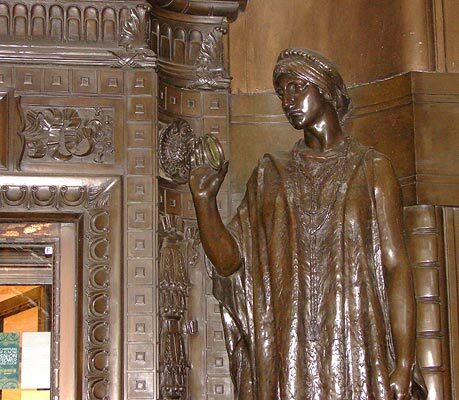 One of the changes they instituted was this Egyptian Hall and an accompanying Egyptian escalator which runs through all the way to the top of the store with hieroglyphics displayed throughout its length. This was done with the assistance of the British Museum for authenticity. 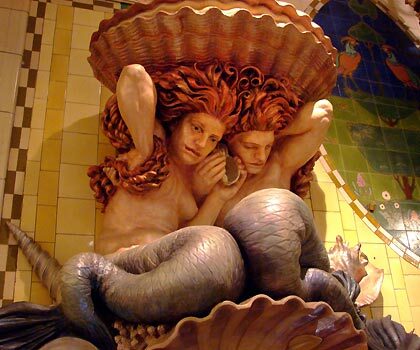 Despite keeping traditional features like this decorative tile and statuary, some of the architectural changes and the generally updated feel of the place have not been well-accepted by all of the British public. Fayed is credited - or condemned - with bringing about a sort of degentrification of Harrods; indeed, "vulgarisation" is the term some use. 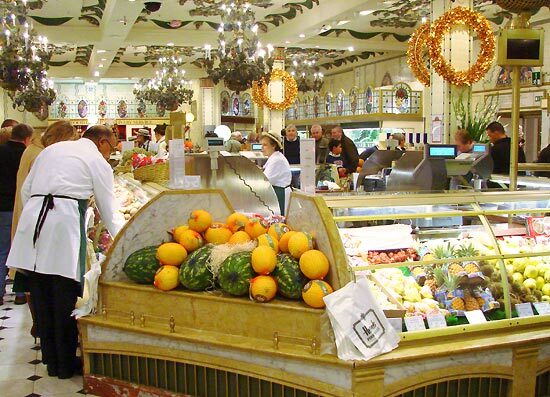 Harrods is over 150 years old, you know, and for a good portion of the 20th century was strongly identified with the traditional British class system as a place where upper crust was welcomed and everyone else was tolerated with a certain condescension. Selfridges was more where the middle class belonged and other stores catered to the masses. There's a good overview of this at an article in the British magazine, New Statesman. 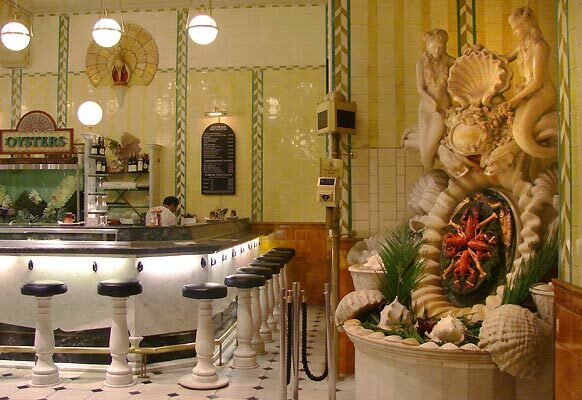 Harrods was a favorite of Alfred Hitchcock, who had fresh herrings flown to him in Hollywood from this store. Harrods has many other links to the famous. Oscar Wilde and Queen Mary shopped here, and the store also served celebrities in unexpected ways. For example, the store embalmed Sigmund Freud back when it was also in the funeral business. 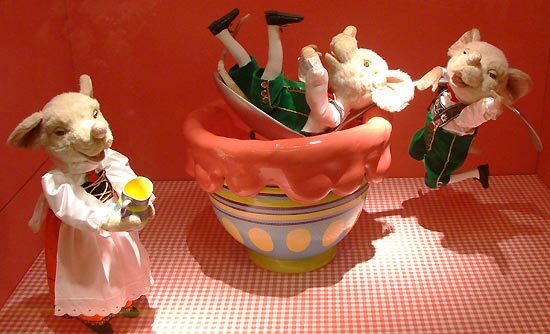 Some of the people who worked at Harrods' zillions of counters went on to gain notoriety. Pierce Brosnan worked at Harrods before he became Remington Steele or James Bond; the Harrods website says he worked at the pharmacy while the New York Times says it was in a clothing department called "Way In", which had been started to counter the popularity of London's 1960s-70s mod hang-out, Carnaby Street. The food counters of London department stores are always fun to observe, though it's usually impractical for me to buy anything. All sorts of exotic cheeses, vegies and meats can be bought here. 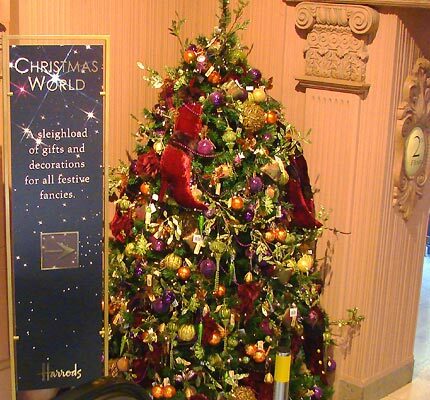 Live critters, as pets, are also sold at Harrods. The pet department sold an alligator which was given as a Christmas gift to Noel Coward, and Ronald Reagan received a baby elephant named Gertie. I didn't stop by the pet department to see if they were still doing anything as irresponsible as selling baby alligators, thought I guess that would have been normal back when it happened. Winnie the Pooh has his origin at Harrods, according to their website. Author and Pooh creator A.A. Milne bought the original Winnie the Pooh for his son Christopher Robin here. 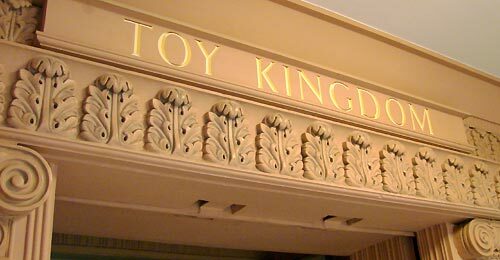 Speaking of toys, Star Wars' Darth Vader actually worked here once. Actor Dave Prowse was working as a fitness consultant in the sports department of Harrods when he was discovered and cast as the Sith Lord who begat Luke, Leah and a million action figures. Of course I hit the toy department, where I ran into more Doctor Who stuff. 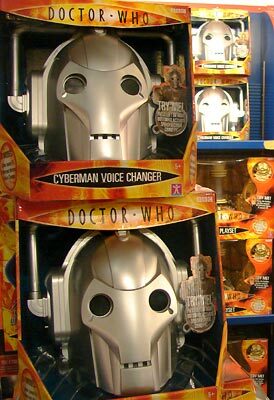 This Cyberman voice changer helmet was pretty cool, but too big and expensive to take home. Besides, methinks me has too much of this stuff laying around already. 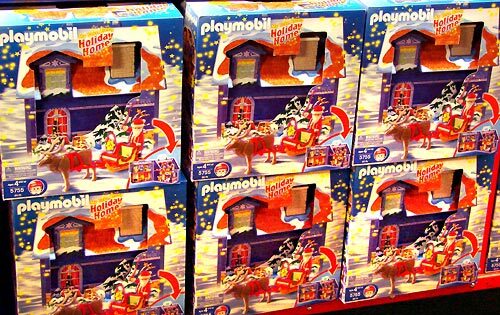 Playmobile toys have become more popular in the USA since I first saw them in England in the early 1990s. I took note of the Playmobile Christmas stuff at Harrods and this Holiday Home was the only piece I did not see in Midwestern US toy stores upon my return. 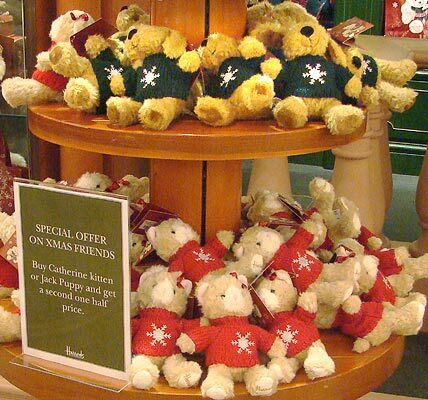 A legion of Harrods Christmas Bears, Catherine Kitten and Jack Puppy, model sweaters for Ace. He must have bought one of each because he was seen recently wearing both the green and red sweaters...no word on what happened to Catherine and Jack...though I hear they were seen wandering around London naked and eventually found work in Soho. Near the toy department, I saw the only automated display I could find, these festive mice. The movies of Christmas automations I posted recently were well received, so here's a flick of this one. 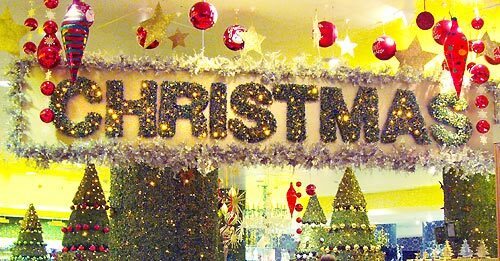 I bet that Harrods and the other London department stores had such things in their windows closer to Christmas, but in Late October we were a bit too early for that. By the way, I posted this through You Tube, so if you're seeing a white rectangle, they're probably down for a bit. 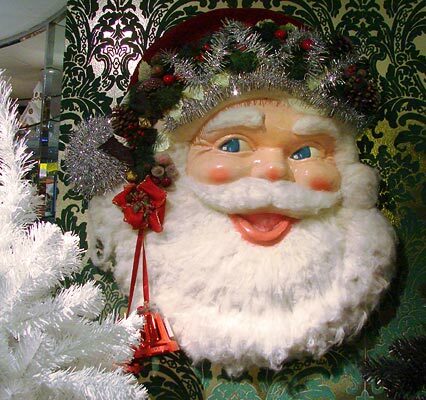 And now, down the escalator to the proper Christmas department in the basement. Christmas crackers are always something I look for in London. 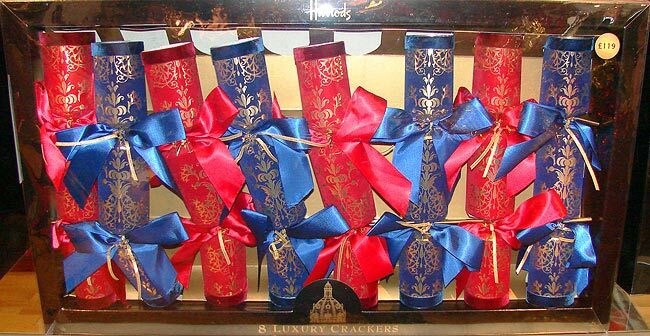 Crackers are party favors designed such that you hold each end and pull hard, which makes a loud snapping noise. There is usually a party hat or trinket inside. I'd only seen crackers in movies before I went to London the first time in 1991; I'd read occasional references to "crackers" in books, but thought they meant the kind you eat. I do remember one of the James Bond films, or a parody of same, has a scene in which a party cracker explodes. This box of crackers was 119 pounds; for that money (about $210) they should sing and dance. Another customer asked what their most expensive package of crackers cost; the employee didn't know, but did say they had a package of six or eight for 600 pounds. For that price, diamonds better fall out of them. Harrods seemed to have more traditional decor than did Selfridges. Across from Santa, Mrs. 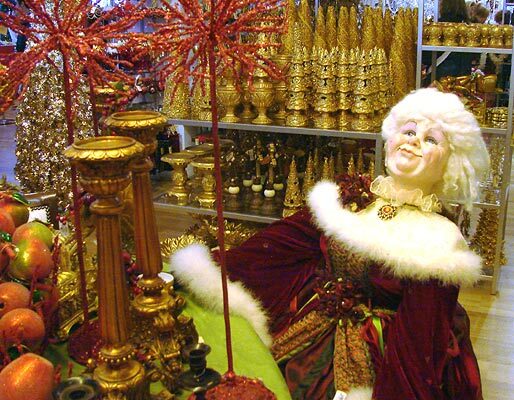 Clause relaxes amid brass decorations. Did Mrs. Kringle dress like this in her youth? Is this how she netted Santa? 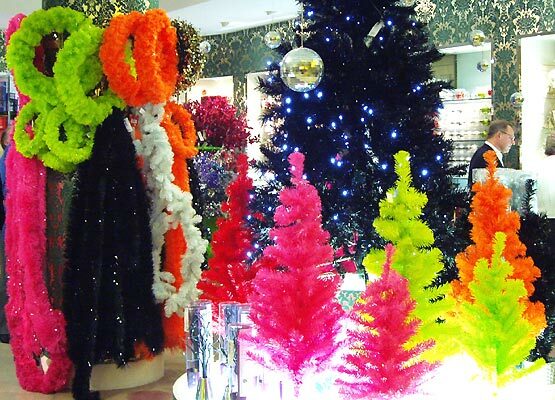 A friend of mine bought some of this glass-beaded garland. The employees were very helpful. 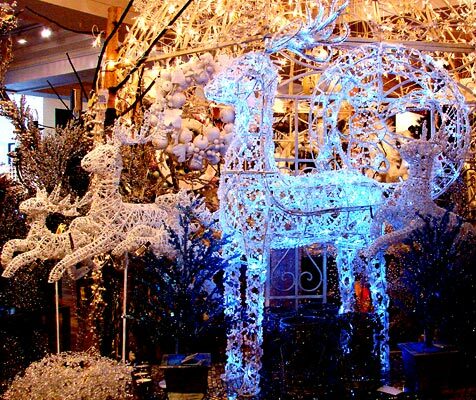 Wire reindeer were popular in London, just as they are here in the states. 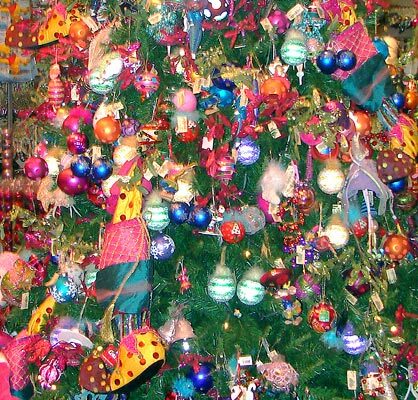 This Harrods tree utilized bright colors and ornaments with polka-dots. What did I buy on all these three shopping junkets? Not much at those prices, but I did get a few things. 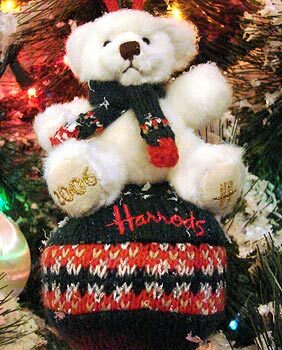 Aside from the Bears with shirts for Ace, I got my mom this Christmas ornament at Harrods. So, what else did I buy at these three stores? Selfridges: I bought this reindeer for myself at 10 pounds and 95 pence. 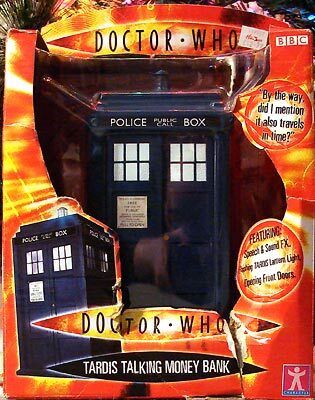 Hamley's had the best deal on this Doctor Who TARDIS at 12.95 pounds. Ace said something about souping it up with jackalope technology and making it actually work. Oh, great - now I'm afraid I'll be looking at a painting of Washington crossing the Delaware and I'll see antlers in the background. Another interesting post. You and Ace seem to be well traveled. Great pix. 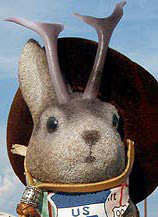 An American Jackalope in London. Very clever. 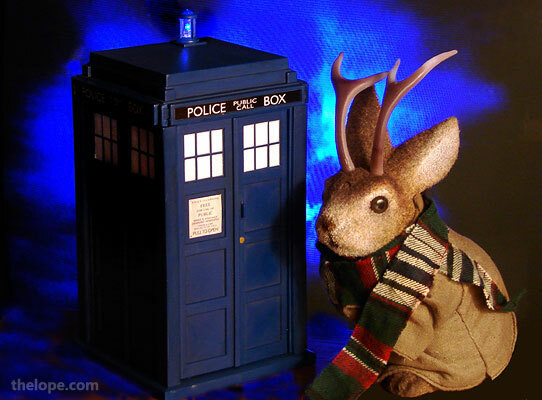 I feel a kinship with you because I have featured the jackalope in a blog post. Okay it was just one blogpost, but it was heartfelt. As Arnold is wont to say, "I'll be back!" Gem, thanks for being the first comment on the blog in its new location! fabulous! I enjoyed this very much.